Photography can become in time a collector’s sport. This meaning, like any endeavor you start acquiring more and more gear over time and start to thinking you need to use it all the time as well. This is especially true when you’ve paid a king’s ransom for a few high-end prime lenses and you must use them on every occasion. You don’t want them sitting on a shelf gathering dust just because it’s extra bulk to carry when you’re out on a shoot. That’s until the novelty wears out of carrying 15 lbs of lenses everywhere and swapping them out every minute. Having every conceivable lens at your disposable on a shoot seems ideal, but in the real world most photographers don’t want to feel like they are moving house every time they take kit to shoot. It usually comes down to what is the bear essential kit you need to get the job done. For instance, on a wedding shoot your trying to capture every single moment. You have to be quick on the draw all through the day and if you are slowed down with constant lens swapping, it just added complication, added weight and you can miss some precious moments. You just don’t have the time to deliberate over swapping out a few prime lenses when a quality zoom can do the job, even with two+ camera bodies. Therefore, carrying three zooms which cover wide-angle, medium-range and telephoto can cover most photo assignments. A 14-24mm, 24-70mm and 70-200mm usually do the trick. 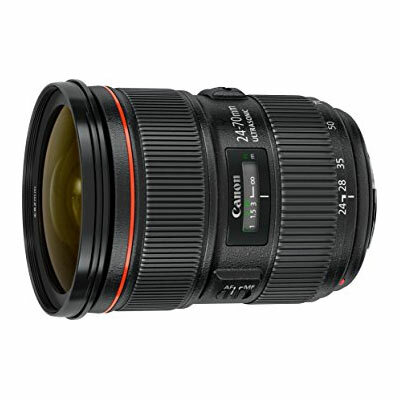 Covering the widest end of the focal lengths, a 14-24mm zoom is a common choice. 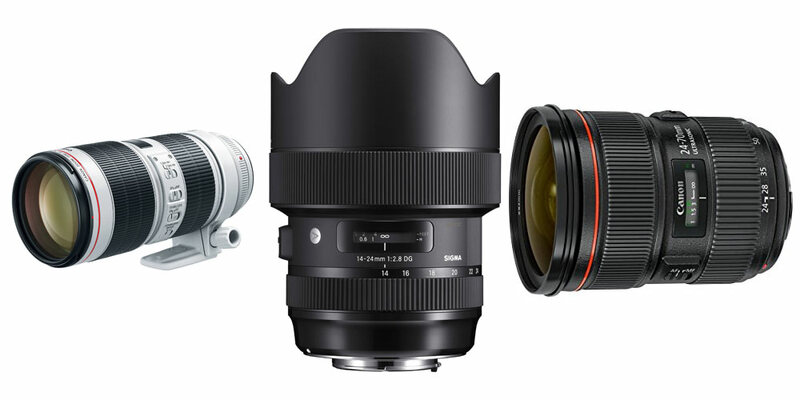 A Nikon AF-S 14-24mm f/2.8G IF-ED, Canon EF 11-24mm f/4L, or a Sigma 14-24mm f/2.8 DG HSM are all good quality zooms. These focal lengths are great for covering landscapes, views of the sky, architecture, tight spaces or anywhere you want to get a wide expanse into the frame. Quality zooms in this range let in lots of light with large apertures (f/2.8 ideally) and allow you to get lots of detail into the frame. Just a few ‘mm’ in this range makes a lot of difference with how wide the lens can go. Image quality is also fantastic if you pick a high-quality version like the ones above all and your wide-angle needs should be covered. I almost live exclusively in this focal range. It’s just wide enough to shoot landscapes and work in tight spaces and just long enough for tight portraits. Some examples include the Canon EF 24-70mm F/2.8L and Nikon AF-S Nikkor 24-70mm f/2.8G ED. If you can afford one with image stabilization they are even more versatile. 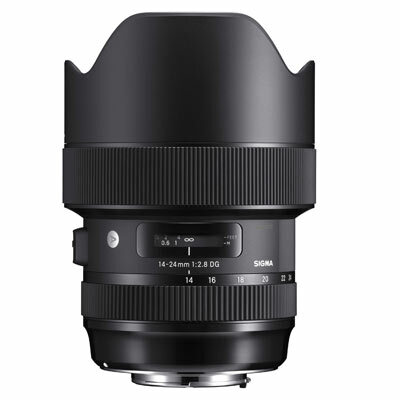 Quality versions are wide enough at f/2.8 to cope with low light, usually weatherproof and being a common zoom range, there are plenty on the market. If you count in image stabilization, a wide aperture, weatherproofing and you could only ever carry one zoom lens, this would be the range to go for. So if your money could only stretch to 1 top of the range zoom and you had to budget down on the rest, a 24-70mm would be the top of my list. I know a few wedding photographers who only use this focal range all day long and still get great results. On a crop sensor camera body you get a bit more telephoto range, more near 35-85mm. A 70-200mm focal length is very common when you need to go long or very telephoto. 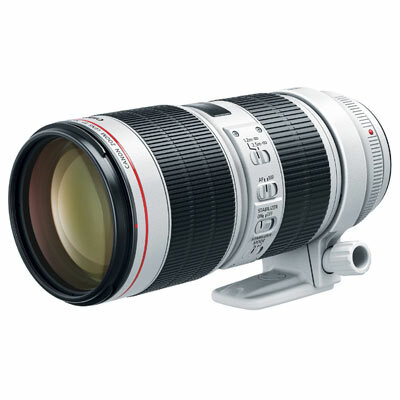 Examples like the fantastic Canon EF 70-200mm f/2.8L IS III are workhorse zooms, built to take the rigors of daily shooting. Quality versions should be ideally f/2.8 or f/4, have image stabilization, weatherproofed and built like a tank. This focal range is great for sports or wildlife or anywhere you need to get in close from a distance. It’s also good for portraits from 80-110mm with f/2.8 versions giving extremely nice background blur. You can see many of these lenses at sporting events, especially the Canons which stand out a mile with their white lens barrels. You can buy longer focal lengths, but these are more specialist lenses, usually primes and if you want a telephoto zoom which goes further than 200mm, then it’s usually a compromise of longer focal length for image quality. The whole point of this exercise isn’t to exclude prime lenses or other zooms from your arsenal. This is about getting the best image quality and the most practical/lightweight kit that can cover most situations. The three focal length zooms above will cover the majority of situations you come across and won’t leave you wanting. 14-200mm in 3 lens will give you maximum quality for the least amount of kit. There will always be occasions where you may need ultrawide, a prime lens or a very long telephoto. A fisheye lens just because you can, an expensive portrait prime lens or a $10k+ 600mm lens for the Super Bowl all produce great results, but you’re less likely to be using these type of lenses all day everyday. If you’re starting off and still deciding which zoom lenses to buy, you can’t go wrong with the focal lengths zooms above. I would start with the 24-70mm, then decide if the images you capture the most are more wide-angle or very telephoto. This will dictate your next zoom purchase. If you capture more buildings and architecture, then you would go for the 14-24mm. If you capture more wildlife or sports images then it will be the 70-200mm. Slimming down to exactly what you need will both save you money in the long run, on-the-job frustration and back health. Fewer choices in life sometimes can be a good thing.